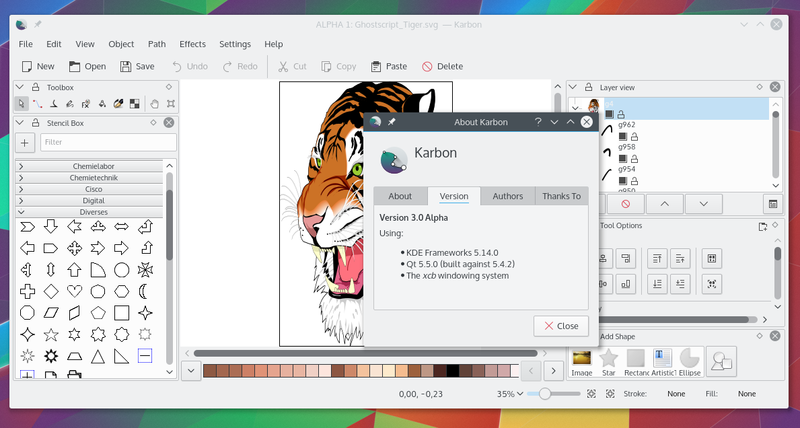 On the road to a Calligra with no more need of the porting util KDELibs4Support another milestone has been passed: Karbon now also is based purely on Qt5 and KF5. You might have discovered on the screenshot that the Stencil box is shown, which in Calligra versions 2.x and before was exclusive to Calligra Flow. Adding stencils for flow diagrams and other things can be also useful in presentations or text documents, so the Stencil box will be made generally available in Calligra 3. It still needs to be thought about how to perhaps merge it with the general Shape box, that is left for later for now and surely something to work on with the VDG. Calligra Flow itself has not seen any porting efforts so far, as the plan is to rewrite it using Karbon components, given that Calligra Flow handles the same document type as Karbon, rich vector graphic documents. The main difference has been that Karbon only supports single-page documents, while Calligra Flow also supports multiple pages. And both UIs have been targetting different use cases. The idea and goal here is the same as with e.g. Calligra Words and Calligra Author: reusing components while providing optimized UI for the different usecases. For now though we are still in the porting phase: get rid of “KDELibs4Support” completely, fix any regressions and then some bugs, also get all unit tests to pass again. So no dreaming about future features yet, first we need a real base for that. A huge step forward. Congratulations!! !